We are encouraging our “cut and come” patch of sorrel in the garden. If we trim it right, it may keep growing for months. The sorrel leaves added a bright lemon flavor to the creamy egg noodles we made for lunch today. 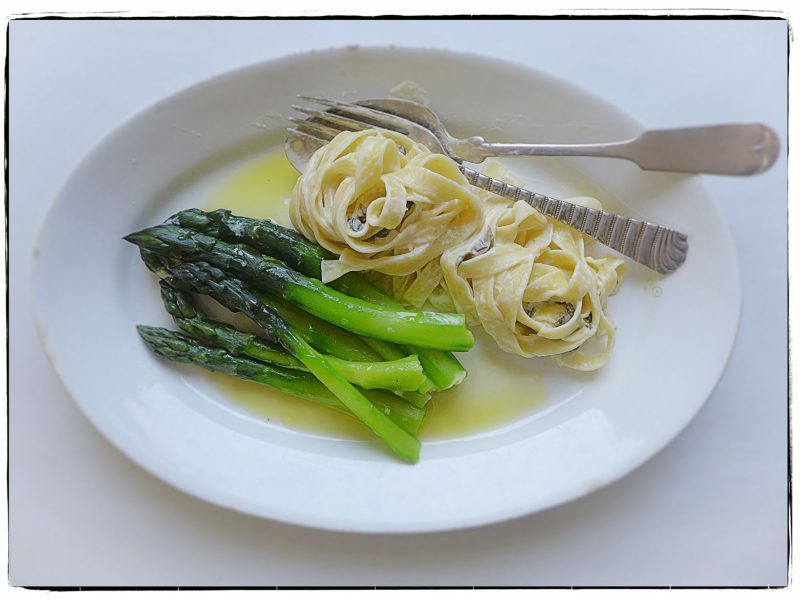 And of course, we are still savoring every spear of asparagus that we can find. End of the week already—it was a short and sweet one. 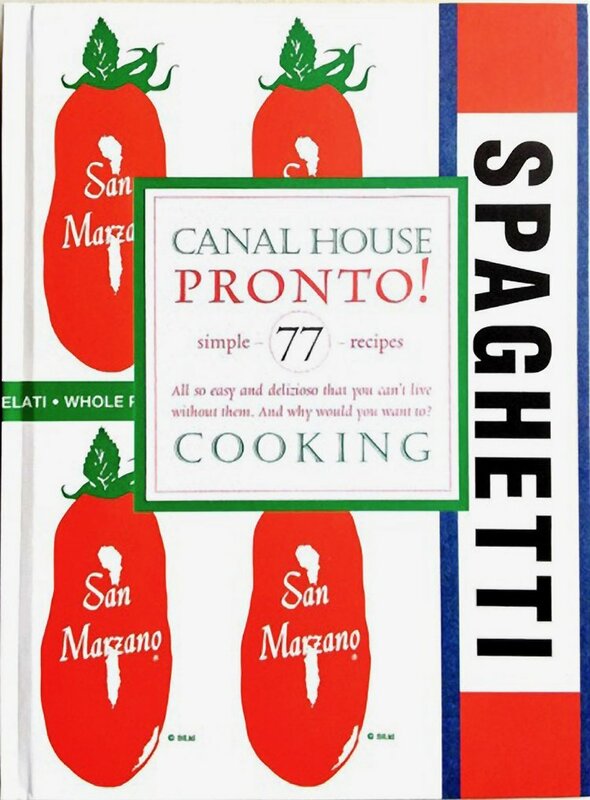 Remember to cook something delicious for yourselves this weekend, dear friends. 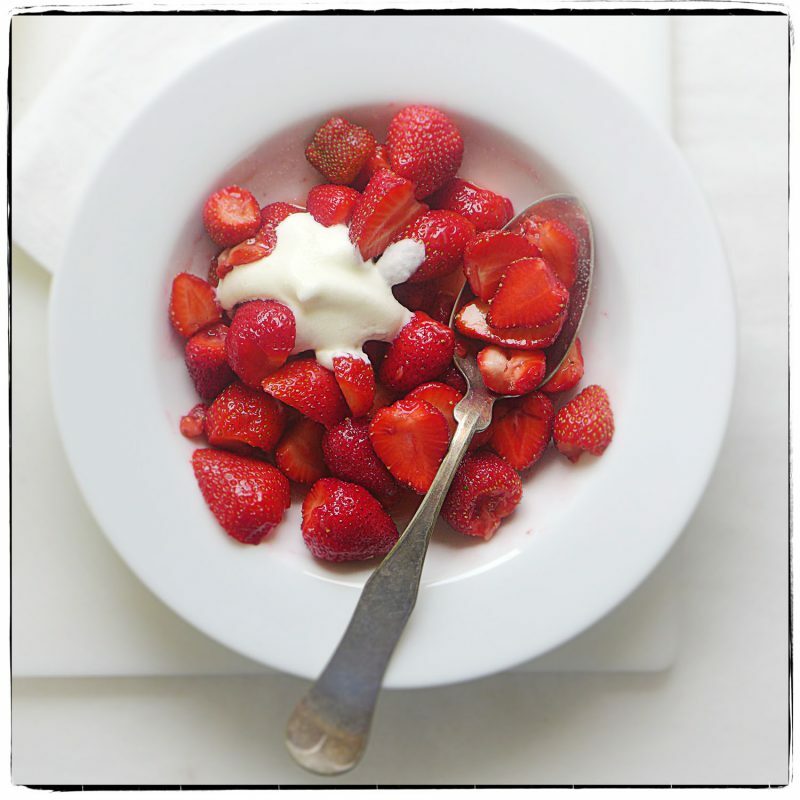 First strawberries of the season for lunch today. And nothing more. A friend of ours had a surplus of cold boiled lobster (can imagine such a plight? ), so he laid two big crustaceans on us. 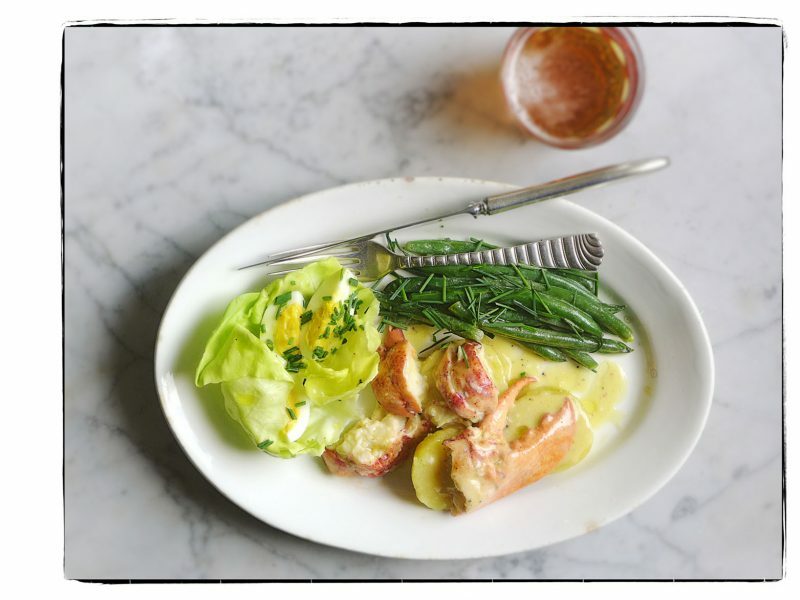 Guess what we had for lunch on this muggy May day—a “summer” salad of cold lobster and potato salad with a mayonnaise vinaigrette, green beans, and hard-cooked eggs with butter lettuces. Oh yeah, and we split a Fuller’s London Pride. Supposed to rain this afternoon. Who cares, we’ll be napping. 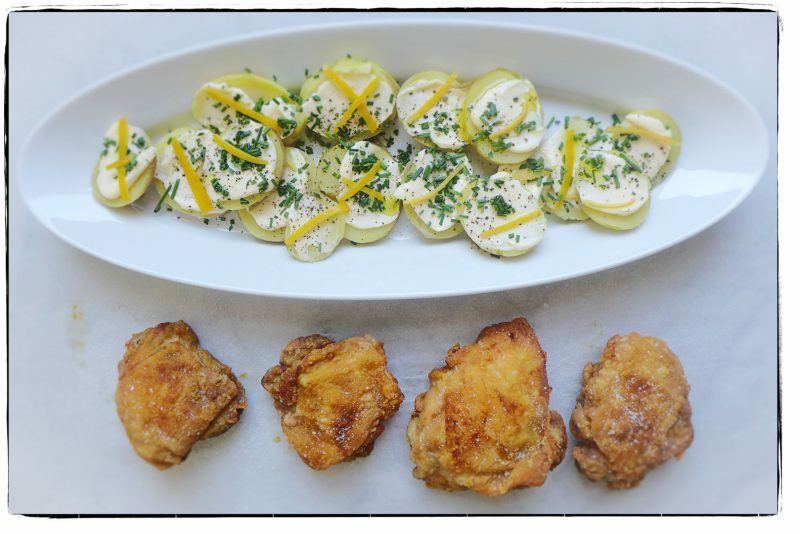 We didn’t satisfy our burning hunger for crisp cold fried chicken and Canal House potato salad with preserved lemon over this long glorious weekend. So it’s day-after Memorial Day redux for lunch today. Jump into summer! We knew yesterday we’d make pizza for lunch today. We had the dough defrosting in the fridge. However, when we got to the farm market this morning to get more asparagus (no, no, we haven’t even come close to having our fill of the grassy beauties), we were delighted to see they had fiddlehead ferns, too. So we grabbed both. 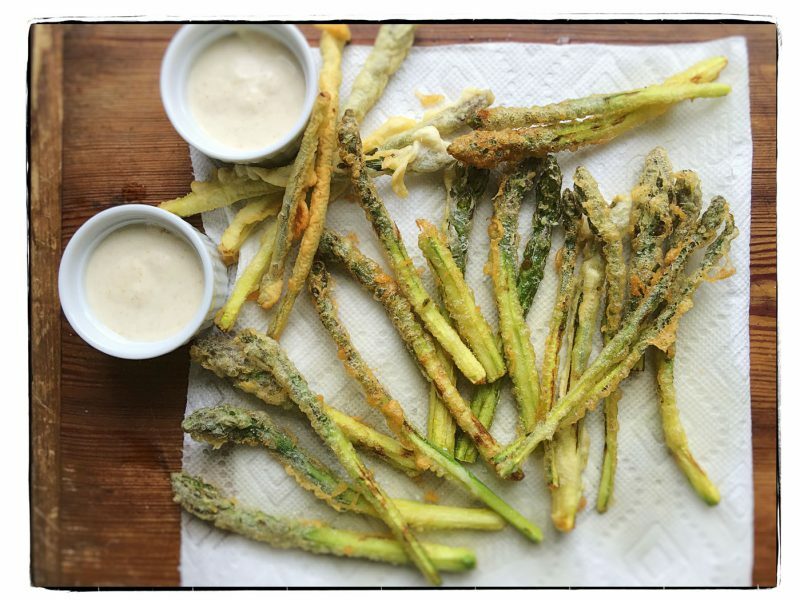 We’ll hang onto the asparagus to eat later this holiday weekend. 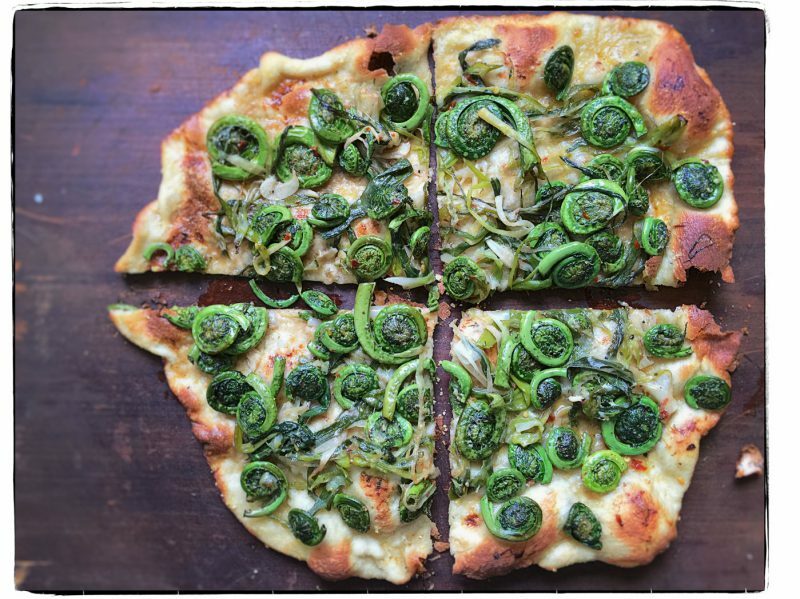 Our pizza today: steamed/sautéed fiddleheads with scallions and slivered garlic in olive oil, and a little crushed red pepper flakes and salt to bring up the flavor. Have a wonderful weekend. Walk, swim, hike, frolic, but most of all, remember to cook something delicious for yourselves, dear friends. Pretty sure CH had a good b’day yesterday, full of beauty and deliciousness. A mystery NYC walkabout included: a stop at 57th Street’s Marlborough Gallery to behold their wonderful collection, a quick visit to the terrific new Whitney Museum (we ran out of time, there’s so much to see! ), and a celebratory dinner at “Untitled”, Michael Anthony’s new place at the museum. Chef Anthony has a magical way with vegetables, and so, duly inspired, we landed on this for lunch today—delicate asparagus fritto with masala-seasoned yogurt. Were we in heaven yesterday? Nope, just in good old/new NYC. A light lunch—cold poached cod and asparagus with a parsley-preserved lemon mayo and scallions—before we head off to NYC to attend the cookbook release party for Korean cooking sensation, Maangchi. Fun! Tomorrow a day of hard work: a mystery birthday walkabout-the-city for CH. Where we goes, only MH knows. We’ll report back on Thursday. 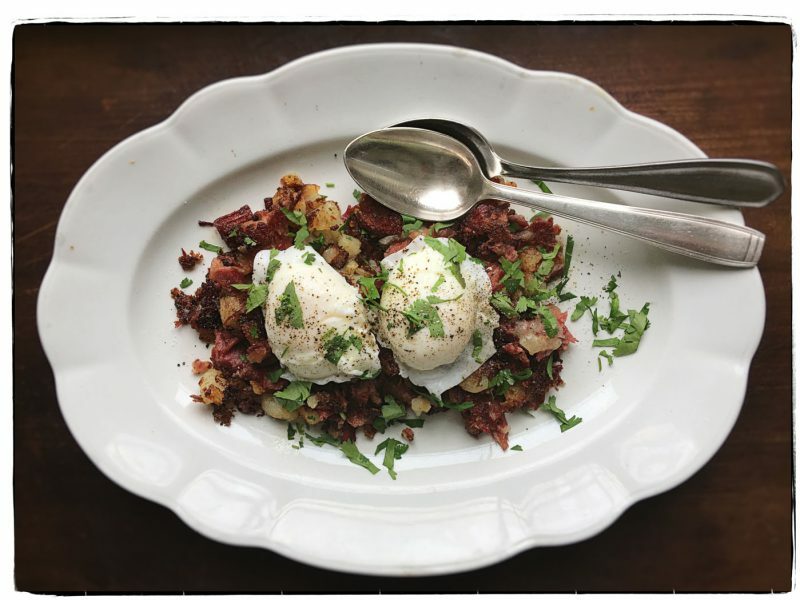 We couldn’t wait for lunch, so we had breakfast instead—corned beef hash and poached eggs. This is a good way to start the week—better than Wheaties. We had a craving for ham and cheese sandwiches this morning. 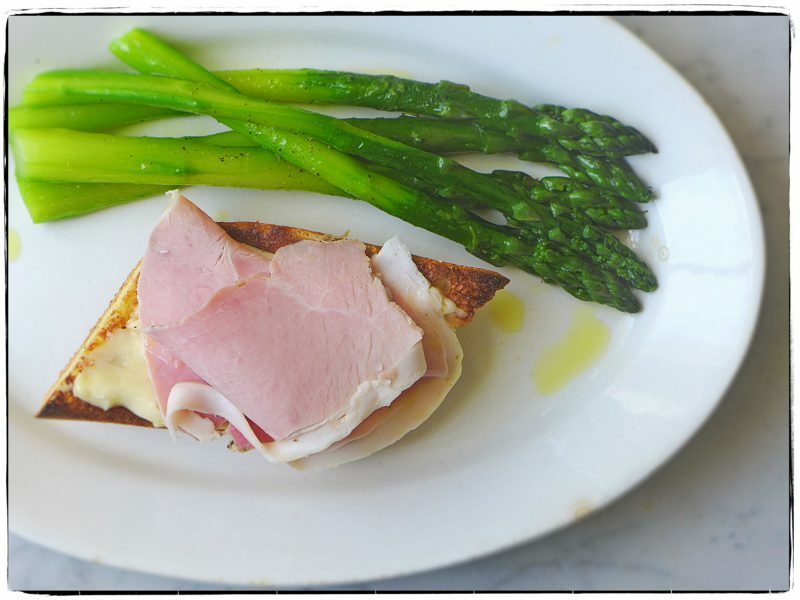 So while we were out running errands, we grabbed some prosciutto cotto, a slab of gooey taleggio, a crisp baguette, and a bundle of fat asparagus (instead of potato chips). 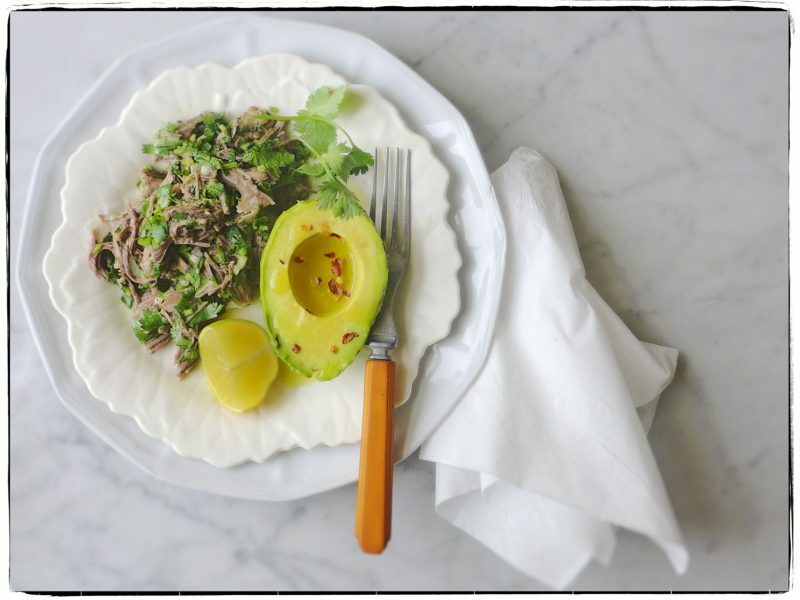 We believe in feeding the need, and this idiosyncratic spring lunch sure hit the spot. Off for a quick walk on this lovely day; remember to do something just for yourself. When in asparagus season, eat asparagus. And we are. 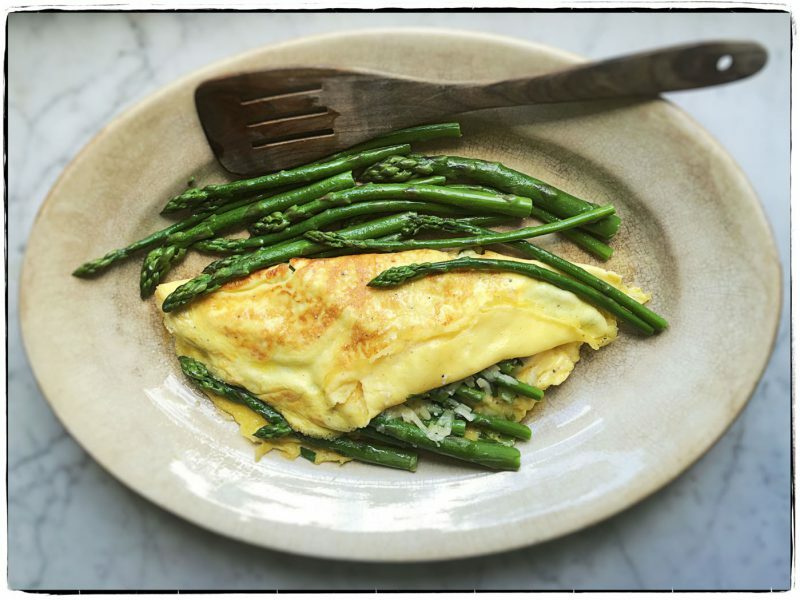 Today, we sautéed green spring onions in butter and folded them into an omelette along with grated Island Brebis cheese and skinny asparagus. And just to make the point, we served it with more asparagus. 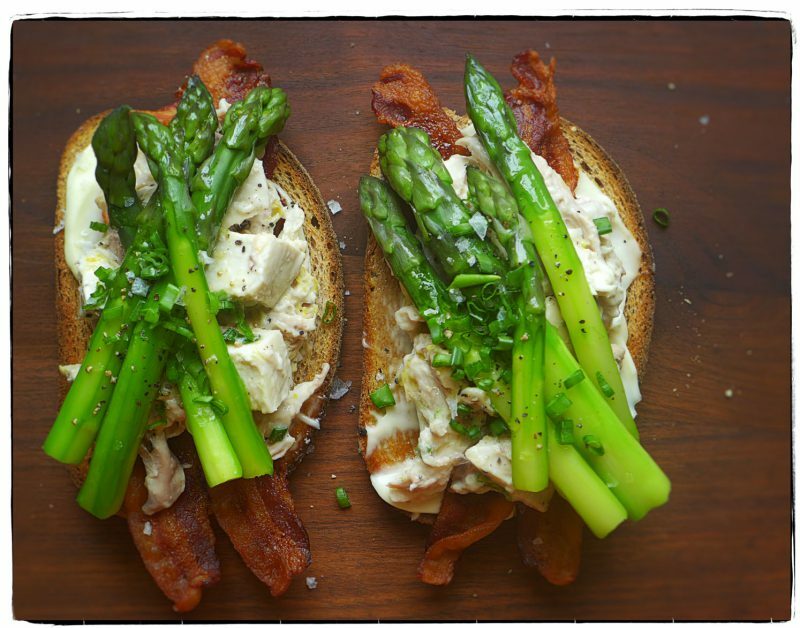 We made chicken salad with lots of lemon zest, piled it on mayonnaise-smeared toast with crisp bacon slices, then added asparagus and scallions dressed with olive oil and s & p. The hot weather has brought on those grassy green spears in a big way, so we are going to eat them while the eatin’s good. Maybe we’ll take our sandwiches down to the river and have a little picnic.